Check out this video for part two of the chicken tractor construction. We are added a nesting box, back panel for the detachable part of the coop, and a watering system for the chickens while there are cruising around the yard. In the first part of the chicken tractor construction I added the wheel system that lifts the coop up a few inches to be moved and then allows for it to rest flat on the ground once out in place in the yard. The wheel system was the trickiest to engineer but the nesting box, back panel, and watering system took the longest to build. I had over 60 minutes of video that I tried to condense into this 12 minute clip! Now the chickens have water and a place to lay some eggs while out and about the yard. 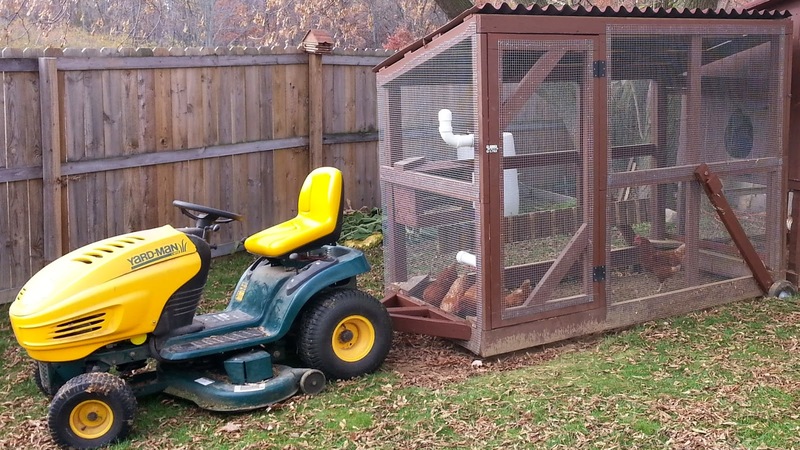 The idea of this and any chicken tractor is really two things. First, we want to let the chickens have some new ground to scratch through for worms, grass, bugs, and just some new scenery. Secondly, I wanted to be able to easily move the run away from the coop for an easy once per year cleaning of the chicken area. This way I can roll it out and while the chickens are in heaven scratching away on some new ground I can quickly cleanup and add some fresh dirt/sand to the run and then push it back. So far I think that this chicken tractor has met both of those goals and it makes the chickens lives a little better and mine as well! LOVE IT! Now, could you come make one for me? Hello from the Homeacre Hop. Good reliable used lawn mowers made of durable material and easy to handle can be purchased from a few hundred dollars depending on age and condition. We apologize for the problems you're having! I can get the pictures to load, there is just one photo on this post and the YouTube video embedded. We are on a DSL internet connection, which isn't the fastest, but certainly not the slowest. Is it the entire website, or just this post? You may also want to try a different browser, such as Firefox or Chrome or Internet Explorer. If you are a new net user afterward you need to visit constantly this web page and read more the updated posts at same here. Construction companies historically do not really market themselves (as a general rule) but do historically rely on word of mouth or on recommendations from friends in the trade. Could you tell me what you used as a spacer between the wheel apparatus and the run itself? The handled pivot point? Thank You for all your hard work. Your wI truly get pleasure from while I read your blogs and its content.ebsite is for sure worth bookmarking. I don’t suppose many of websites give this kind of information. Keep it up!! You have done the nice job having provided the latest information. Welcome to Simple Suburban Living! Where the subdivision meets the country! This blog chronicles projects, tips, and ideas on how to live in suburban America faithfully, sustainably, organically, and happily using today's technology. We are homesteading as much as we can on this little plot of land we have! How To Build The Simple Suburban Chicken Coop - Free Printable Plans! Wood Burning Pool Heater - Heat Your Pool For Free!